In responding to the call to measure and demonstrate value, archivists must confront the shifting value propositions of archives and grapple with the practical and conceptual limits of evaluative practices in telling the story of archival value. The presenters explore the "value story" of archives, examining: What are the different values at play in the archives? What values can and cannot be measured? What is the role of storytelling in communicating meaning and impact? Rachel Ferensowicz received her M.L.I.S. 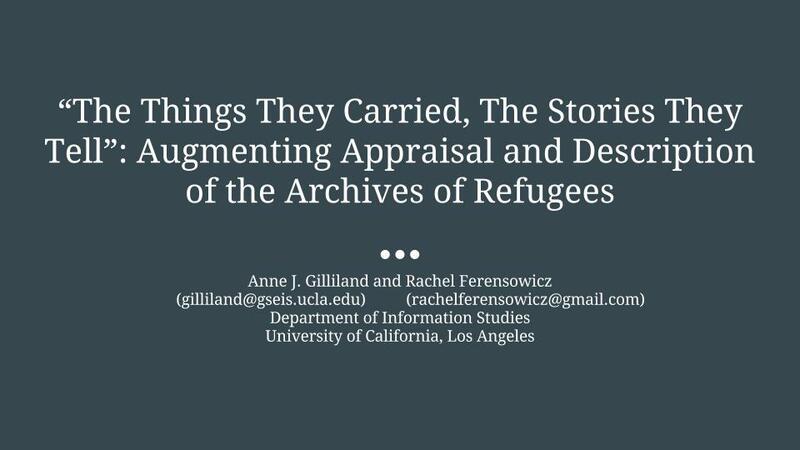 from University of California, Los Angeles in June 2016, with an emphasis in narrative, myth, and storytelling in archives. She holds her B.A. in Theater and Performance Studies from University of California, Berkeley. Jennifer Meehan serves as Associate Director of the Stuart A. Rose Manuscript, Archives, & Rare Book Library at Emory University. She has written extensively on archival concepts of evidence and value and the theory and practice of archival arrangement and description.